I've been stitching on Memories this weekend. I'm really enjoying it. The colors are so bright, I'm not used to stitching with such bright colors, but I like it. It's fun! 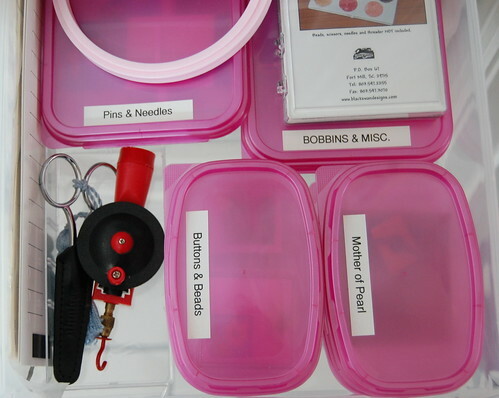 Excellent idea to try to find a storage cabinet for organizing and to make packing easier. I bought a cheap armoire from Kmarts (really ugly so I call it the big ugly) and I packed up all my stitching in it for our move. Just had to secure the door--sons complained that it was a bit heavy, lol. It would be far heavier now, ten years later. My stitched pictures I packed up in a trunk. Second hand store sounds like a good idea, you could even use an old china cabinet. 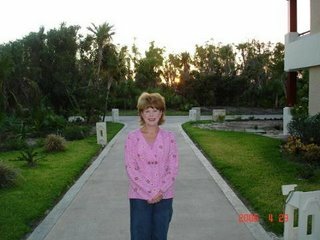 Your Just Nan is looking beautiful, so bright and spring-y looking. It's gorgeous! I love the colors on it. your organization system is terrific, I love organization. Great progress and JN, and love your organising, something I must do. Memories is looking just gorgeous Nicole! I just love how you have organised your stash - it's so pretty and functional too! I bet you had fun putting everything in its place! Memories is looking wonderful. Just Nan pieces stitch up so quick and lovely! Great job with your organizing too. I store my fabrics that way too. So much easier to find. Love your organizing system, it's so tidy! I really must look at sorting out my stash a bit more. Memories is looking great. 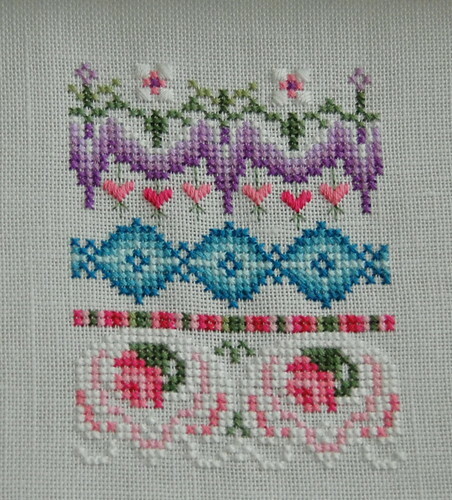 I too don't ususally stitch in bright colours but sometimes it makes a nice change. ... Must hop off this computer and try to do some stitching today myself! This is fantastic! I need to get organized already and I don't even have that much - but I'm already realizing I need to have a place for everything. 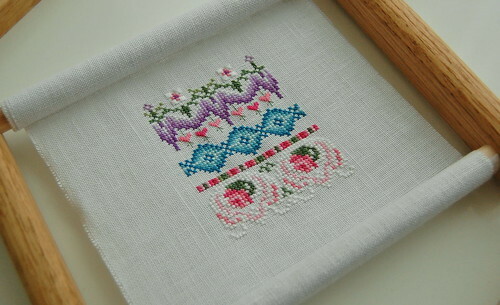 Do you railroad your stitches? They are so nice and even looking. I've been railroading lately and it really slows me down. But you stitch so fast! I love your progress on Memories. The colours are just beautiful. Wow you've got your stash really well organised! 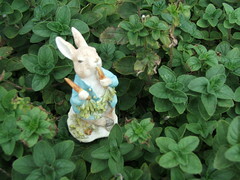 Nicole, your latest projects looks so fresh - a nice change after a long winter! J'aime beaucoup your blog ! Hi Nicole, thanks for visiting my little piece of cyberland. I'm envious of how organized you are! I've been thinking about getting some sort of cabinet to organize the stash but haven't made the leap yet. An excellent start on Memories - such pretty colours. And as for your organizing system - wow. I must look out for some similar - my threads are organised, I have a database of charts but I need somewhere for fabric and finishing. This looks ideal but Joann's don't ship to the UK and I don't think I could get that in a case on my next trip. I wonder if Staples here has something similar? I hear you on getting organized! 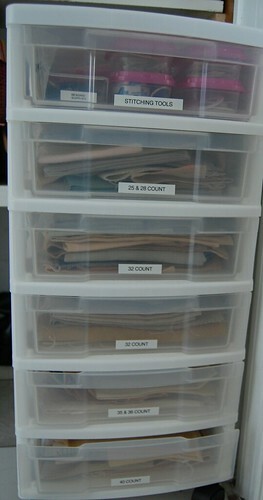 I have a number of "Container Store" plastic boxes - I've been using the "sweater" boxes for my stash and linens. Unfortunately, I don't have one single place to store them - they are in a couple of closets. I can't wait until I get my own place - having a craft room is high on my priority list! Very pretty! Boy are you organized, love how you've arranged everything. Memories is beautiful! Love those bright colors. 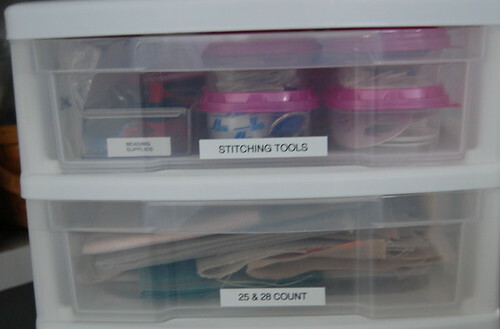 Love your new storage drawers - great idea! You are really inspiring me to get organized! I have so much to do to get my charts and threads in order...but your pictures are like a shot in the arm! I enjoy your blog and the lovely work you do. You are very smart to get origanized before you move.